MILAN, Italy -- Talks in the Ukraine crisis have deadlocked. Russia is refusing to be swayed by the persistent negotiations, and it is difficult to see a way out of the conflict, says DW’s Bernd Riegert. We all know that talking is better than fighting. The fact that the difficult talks between Ukraine and Russia, in the presence of European leaders, are even still going on is an achievement in itself. The crisis negotiations on the sidelines of the ASEM summit have not resulted in a breakthrough, or any serious progress. Both sides are refusing to budge from their positions in the Ukraine conflict. Ukraine and the EU feel threatened by an aggressive Russia. 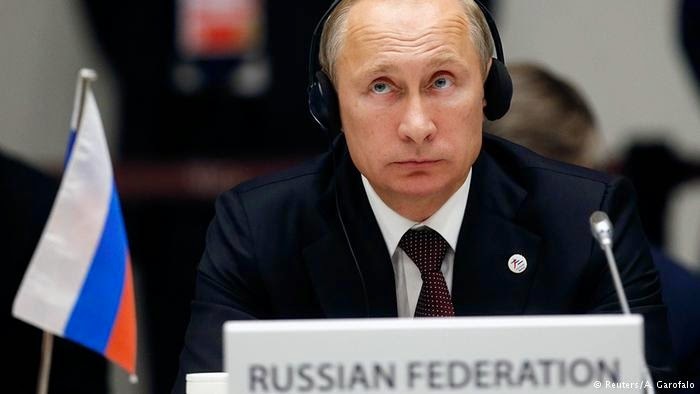 The Russian president feels he's being blackmailed by the EU's sanctions. The other side is always to blame. And there's no sign of any willingness to compromise. Russian President Vladimir Putin is feeling strong. His behavior has clearly demonstrated this to the others at the table in Milan. He arrived late for a meeting with German Chancellor Angela Merkel, he partied at night with his friend Silvio Berlusconi, and was careful to look indifferent in front of the cameras. Putin again threatened to restrict gas supplies to Europe. The EU responded by saying it doesn't need Russia's gas. Putin is not likely to back away from a showdown. Then the Europeans would have to prove how long they can stomach rising gas prices. In Milan, Ukraine and Russia once again committed to the peace plan from Minsk, which calls for a permanent truce in eastern Ukraine. But, especially coming from Putin, the words rang hollow, as the Kremlin has not exactly been acting quickly to implement the plan. So far, there has merely been an announcement that Russia would withdraw its troops from the border to Ukraine, but no actual movement. That's why there cannot be any loosening of European sanctions against Russia. There were small steps of progress in Milan on certain points, but they do not constitute any significant improvement. Russia at least appears ready to agree to an OSCE mission to monitor the borders of two regions in eastern Ukraine with drones. But the details remain more than unclear. Unfortunately, it looks as though Russia and Ukraine are heading for a second "frozen conflict." The instability in eastern Ukraine, which is ruled by pro-Russian forces, could become a permanent situation. People in Crimea have gotten used to the annexation and occupation, and it's not something that can so quickly be changed. There's a system behind it. Russia has deliberately plunged all those states in its sphere of influence that lean toward the West or aim to join NATO into "unsolvable" conflicts. South Ossetia and Abkhazia in Georgia. And now Crimea and eastern parts of Ukraine. This rules out NATO membership for these states, because new members cannot be embroiled in territorial conflicts with neighboring countries. There is no way out of this situation at the moment. Since there is no military option, the EU only has economic sanctions at its disposal. Russia, however, controls the flow of oil and gas. Painful decisions likely await the Europeans. But a positive result of the Ukraine meeting at ASEM in Milan is the nod to further talks and negotiations. The actual summit - a meeting of Asian and European leaders - was overshadowed. European media and politicians focused almost exclusively on the urgent Ukraine conflict. Many Asian representatives didn't understand this. An opportunity for dialogue with them was missed, or at least largely neglected, here.